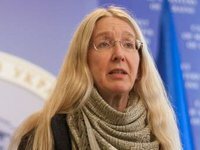 Acting Health Minister of Ukraine Ulana Suprun states that the Ministry of Health will not announce a measles epidemic. "We will not announce an epidemic," Suprun told reporters after a meeting of the Cabinet of Ministers on Wednesday. At the same time, she said, it is important to expand the accessibility of citizens to vaccines. In addition, Suprun called for all to be vaccinated and once again emphasized the safety of vaccines.